Global climate change may lead to reduced water supply to terrestrial environments owing to diminished rainfall. Wetlands are no exception, and macrophytes growing in these ecosystems may experience severe droughts. However, some macrophytes, such as Typha domingensis, can be found on partially dry sites. This study aimed to examine the mechanisms by which T. domingensis survives in dry sites. We examined whether water deficiency reduced the growth capacity of individual T. domingensis plants and the T. domingensis population. 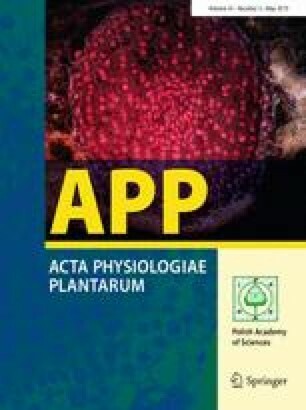 We hypothesized that T. domingensis can overcome some level of water deficiency by adjusting physiological parameters related to leaf anatomy, such as transpiration, photosynthesis, and water use efficiency. We evaluated the effects of drought on growth, leaf anatomy, gas exchange, and water potential of T. domingensis under controlled greenhouse conditions at different water availability levels. Waterlogged and field capacity treatments had similar effects on growth, water potential, and net photosynthesis. Population growth was inhibited at 50% and 25% of field capacity water availability. Drought resulted in reductions in photosynthesis, leaf area, water potential, stomatal density, and thickness of the palisade parenchyma. Therefore, although T. domingensis can cope with mild drought stress, the decrease in functional leaf area eventually limits plant growth under severe drought conditions. The authors thank CNPq [Conselho Nacional de Desenvolvimento Científico e Tecnológico (National Counsel of Technological and Scientific Development)], CAPES [Coordenação de Aperfeiçoamento de Pessoal de Nível Superior (Coordination for the Improvement of Higher Education Personnel)], and FAPEMIG [Fundação de Amparo à Pesquisa do estado de Minas Gerais (Minas Gerais State Research Foundation)] for funding and research grants awarded to complete the present study.